Synopsis: When Dr. Henry Jones Sr. suddenly goes missing while pursuing the Holy Grail, eminent archaeologist Indiana Jones must follow in his father’s footsteps and stop the Nazis. In many ways, Indiana Jones and the Last Crusade, the third — and what was naively presumed to be the last — instalment of the Indiana Jones franchise, marked a return to the exuberant sense of adventure of the first movie in the series. The Temple of Doom had proven too dark for many, most of whom had admittedly been expecting more of the same from Spielberg, and so he attempted to recapture the mood of the original by essentially remaking Raiders of the Lost Ark, but this time substituting the Holy Grail for the Ark of the Covenant (which is knowingly referenced in this movie), and replacing Karen Allen with the grizzled countenance of Sean Connery as Indie’s crusty old pop. The movie’s opening scenes provides us with an entertaining insight into the origins of the Indiana Jones legend. A young River Phoenix plays the young Indie, and does a fine job of capturing Harrison Ford’s facial expressions and gestures as he stumbles upon a band of brigands, led by a leather-jacket-and-fedora-hat wearing adventurer (Richard Young) who also bears a remarkable resemblance to the adult Jones, and who are in the process of ransacking a treasure-filled cave. The episode clears up a number of details, such as how Jones acquired the scar on his face and his fear of snakes, and provides the first indication of his difficult relationship with a preoccupied father. The artefact which young Indie tries to prevent the brigands from stealing provides the link from the film’s past to the present, as we see Jones once more overcoming the odds to finally get his hands on the piece of treasure. 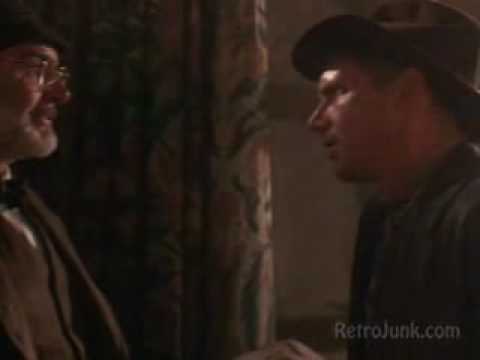 Like the first film, The Last Crusade’s pace hardly ever flags from this moment on, as Indy learns that his father, the world’s expert on the Holy Grail, has been kidnapped just as he is on the point of discovering the Grail’s whereabouts. 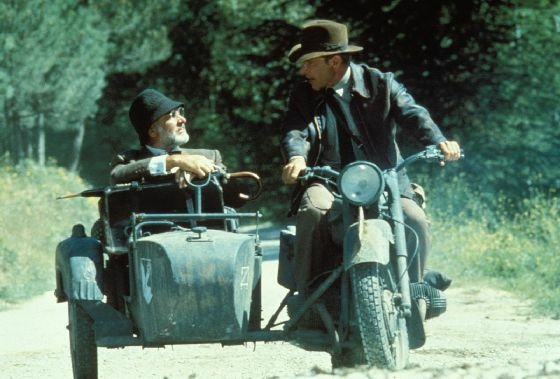 Although, unlike the first film, which provided a rollercoaster ride from the opening scenes, The Last Crusade never really seems to get going until Connery makes his first appearance. We follow Indy and his friend Marcus Brody (an endearingly bemused Denholm Elliott) to Venice, where they run into Dr. Elsa Schneider (Alison Doody), who helps them piece together the final piece of the puzzle Indy’s father was working on. Now in possession of the map that leads the way to the Grail’s resting place, Indy and co. head for the Austrian/German border, where those dastardly Nazis hold Jones senior captive. While Indiana Jones and the Last Crusade is an exciting and entertaining film in its own right, it does suffer from being the third film in a trilogy, meaning that the remarkable freshness of the first movie, which pretty much redefined the action genre, is never quite recaptured. At least, despite following the same basic plot as the first film, The Last Crusade, provides enough variations to provide a decent level of entertainment and action. Harrison Ford is reliable as ever, and his scenes with Sean Connery, who’s a lot more animated here than he usually is, provide a solid counterpoint to the action set-pieces so that things never drag in the brief periods between fist-fights, chases and explosions. While Alison Doody isn’t really given that much to do and her character is woefully under-written, she looks stunning and does well with what she’s given.